We all know that taking care of our skin in the sun is vitally important in order to avoid sun damage and skin cancer. It’s even more important to take care of our children’s delicate and often sensitive skin in the sunshine. It’s our responsibility as parents to protect our children as best we can and to teach them why these things are important. My children ask to have sun cream on now or will say “don’t you think we need sun cream Mummy?”, which makes me feel that they understand the importance and it’s become second nature. We normally use Childs Farm sun cream which is SPF 50+ and doesn’t irritate the children’s skin. A couple of the children suffer with eczema and we find that some sun creams can aggravate that. Childs Farm doesn’t at all and provides long-lasting protection. We used it on our skiing holiday in February and the whole family wore it everyday. The downside of this Childs Farm sun cream is that it comes in a tube. Practically speaking I find that a spray sun cream tends to be easier to apply. That is my personal preference when it comes to adult sun cream and it means that with four children to apply it to, it tends to speed the process up a little. 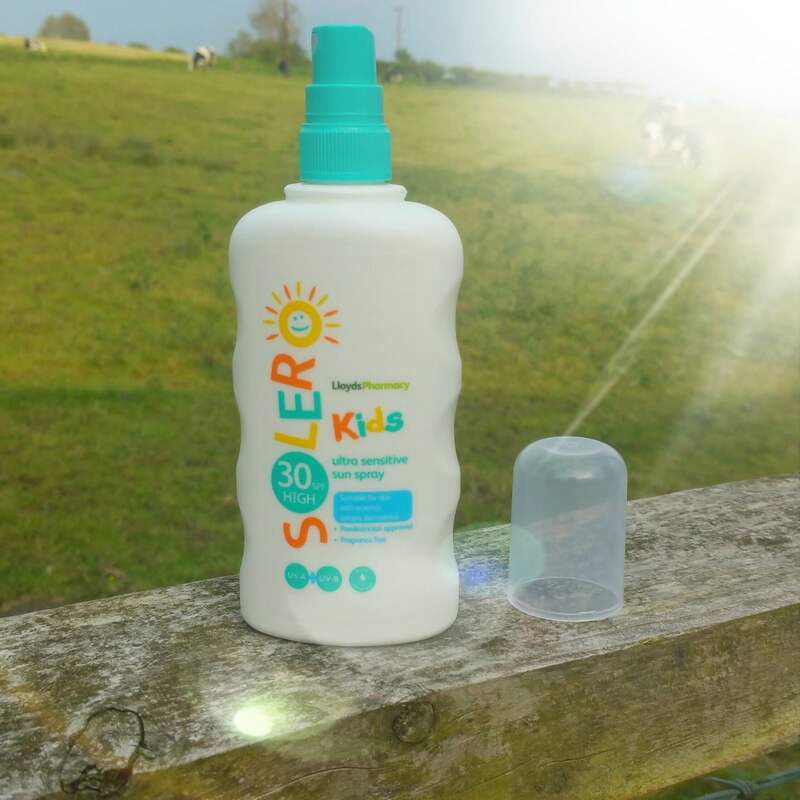 Solero Kids Sun Spray SPF 30 is a highly protective sun spray suitable for children’s delicate skin. It has a high UVB and UVA protection. This sun spray is ultra-sensitive whilst moisturising to keep your child’s skin soft and supple even in the sun. It is water resistant and has a non greasy feel, which always goes down well. It also comes in SPF 50 which, to be honest would always be my preference. When we are out in the sun we try to encourage the children to wear hats and sun glasses. This isn’t always popular but now it’s only one of the children who won’t keep a hat on so things are getting easier in that respect. It’s always a good idea to avoid the midday sun and when swimming on holiday or at the beach I like the children to wear protective clothing to block out the suns rays as added protection. The sun is shining today, so it’s time to open the sun cream! Have a skin-safe summer everyone!